In your written assignments you will need to refer to the ideas of others, for example, the leading scholars in your subject area. The most common way of referring to the ideas of another writer is by indirect quotation or paraphrasing them. Direct quotation, where you use another writer's exact words, is found less often, and the use of paraphrasing has several advantages. Activity 1: What are the advantages of using paraphrase? In this activity you are going to explore what the advantages of paraphrasing might be over using quotation. Read these statements and decide which of them represent advantages of paraphrasing. Select the checkbox next to any that represent advantages. Then read the feedback. In academic writing, you should avoid using too many direct quotations, because this can have a negative effect on the coherence of your argument. Paraphrase usually blends in more easily with your own argument whereas quotation, particularly if it is overused, can break up the 'flow' of your writing. Paraphrasing enables you to express a writer's ideas in a clearer, shorter or more suitable way for your own purposes. This allows the ideas to support the argument of your essay rather than distract from it. Paraphrasing also enables you to express your arguments/ideas more concisely. You may even be able to express more clearly and concisely than the original writer. Finally, paraphrasing creates the effect of a more impersonal style which is often preferred for academic writing. While your sources may also be academic, even amongst academic writers there are differences in style. It is important that a piece of writing that you produce reflects a fairly uniform style throughout. In this activity you are going to evaluate two paraphrases written by students in their essays on 'The Role of Stakeholders in Companies' for their business studies course. Both students refer to key points made in a source text focusing on the interest that governments have in business enterprises. Read the source text and compare it with the two paraphrases written by the two students. Decide which student you think has produced a better paraphrase and make notes on the reasons for your choice in the text area provided. Then read the feedback. Wartick and Wood (1998:103) point out that governments can have a wide range of interests in companies, from supporting them in order to help the economy, to regulating them in order to stop them harming the rest of society. According to Wartick and Wood (1998), governments have interests for a variety of reasons. They are both nourished and regulated by government, in order to keep the economy healthy enough to sustain society. On the other hand, the government may also attempt to control the harms of business activity to others in society. In some countries there is a centralised economy, which the government runs. Select your answer ------------------------------ Student A Student B has produced the better paraphrase. You should have identified a number of reasons why Student A's paraphrase was better. In the next activity you are going to identify the features in Student A's paraphrase that can help you approach paraphrasing in an appropriate way. In this activity you are going to identify the features that help you approach paraphrasing in an appropriate way. Study this list of possible actions involved in paraphrasing and select the tick symbol next to those actions that Student A did and the cross symbol next to those that they did not do. Then read the feedback. Student A provided a reference to the source and used a suitable reporting verb: 'Wartick and Wood (1998:103) point out that...' They included a page reference for the original source as well as the author's name and year of publication. 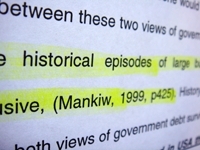 Some referencing systems do not insist on the inclusion of a page reference when paraphrasing, while others always recommend the inclusion of one. • The student writer does not try to express the main points in their own words; instead they keep more of the unusual words ('nourished', 'sustain') and simply replace a few other words. This does not make the text any easier to understand. • Student B tried to keep too much of the original text, including the final sentence about centralisation (which Student A omitted). • Student B did not link this final sentence with the earlier sentences, so the final sentence does not seem to form part of the argument, creating a 'fragmented' effect (this is typical problem when writers try to use too much of the original text when paraphrasing instead of focusing on reformulating the main idea). In this activity you are going to practise paraphrasing four short extracts for inclusion in a student's report about the design and development of customer satisfaction programmes. Look at the four short extracts from source material. Identify the main point or points in each extract, paraphrase each into a sentence or two, use a suitable reporting verb and include a reference to the source material in each paraphrase. Then read the feedback. The majority of surveys between 1997 and 2002 reveal negative experiences of customer satisfaction programmes among companies. Of those who did not develop their own survey, 85% reported unsatisfactory experiences (Shaw, 2002). Shaw (2002) stresses that the development of tailor-made customer satisfaction programmes is an important factor in success. According to Shaw (2002), it will probably be necessary to modify and improve the programme using information gathered from an evaluation process and input from front-line staff. Shaw (2002) reported that staff familiarity with the customer satisfaction programme is important for its successful implementation, as is encouraging employees to report customer satisfaction and make suggestions through offering rewards. Notice how the unusual or redundant words or expressions have been removed from all of the paraphrases (e.g. keystone, cannot be overemphasised), repetition is avoided and generally, the paraphrase is kept short and simple. The main points are expressed in the words of the writer whereas the ideas are paraphrased the ideas and sentence structure is often changed. A clear reference to the source material is also included. Shaw, M. (2002). Satisfaction guaranteed: How to implement a customer satisfaction programme. Southampton: University of Southampton Publications. Wartick, S. and Wood, D.J. (1998). International Business and Society. Oxford: Blackwell. © eLanguages, Modern Languages and Linguistics, University of Southampton, 2014. All rights reserved.